Hello everyone. Today is Day Four of Team Share days over at Hello Bluebird and today we are showcasing the brand new North Star stamp set. 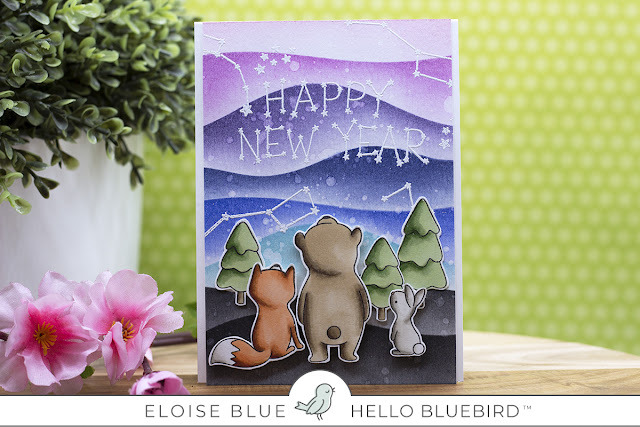 This is the perfect New Year's stamp set that features five characters as well as some constellation stamps. This is such a cute and unique stamp set and honestly it's one of my favourites. 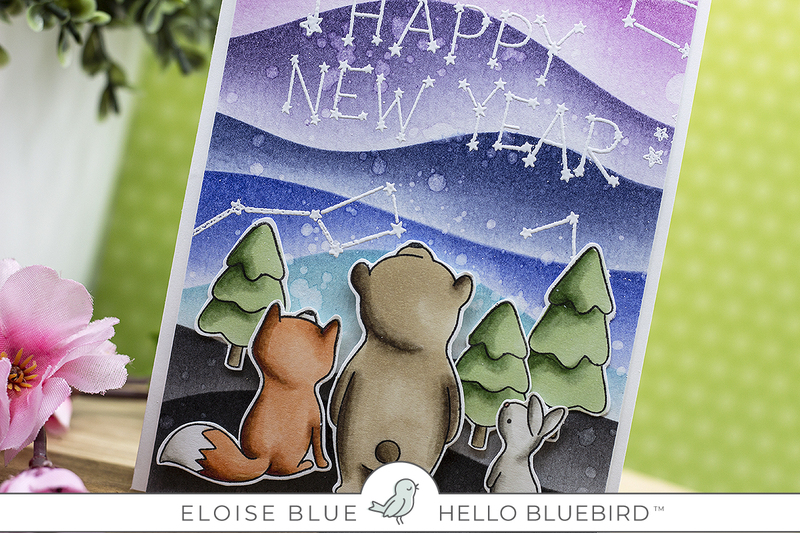 To start off my card today I stamped out my images from North Star and also the trees from Yeti or Not and coloured them in with Copic Markers. I then went ahead and fussy cut out all my images (there are coordinating dies, I just don't have them as of yet). For my background, I decided to use a stencil from MFT to create the background, just because it was easier, but of course you could use the Hill and Dale Dies if you would like to create your own stencil. I used Spun Sugar, Picked Raspberry, Dusty Concord, Chipped Sapphire, Blueprint Sketch, Peacock Feathers and Black Soot for my layered inking. I then flicked on some water and dried it off with a heat tool. I then white heat embossed the sentiment and other constellation images onto the background. Lastly, I added foam tape onto the backs of all the images and adhered them into place and then adhered the entire panel onto a white card base. Thanks so much for stopping by today and I'll see you soon.